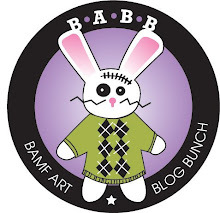 I want one with a BAMF Art Blog Bunch Rabbit on it. George's Dad once did this with an air boat horn he purchased for using on his boat, scared the crap out of us, bell much nicer....hahahhahahha! I would kinda be scared to do this in New York though....hahahhaha! Might be sitting on the bell permanently...hahahhaha!